Now the Astika schools don't agree on much beyond the authority of the Vedas, but one thing they do agree on is the existence of a soul which is different from the body. My question is, how do the different Astika schools prove this? I'm particularly interested in what Pramana or means of knowledge they use, whether Pratyaksha or perception, Anumana or inference, or Sabda or scriptural testimony. The Spirit exists, since composite (objects) are meant for another; since it is the reverse of that which has the three Attributes and the rest; since there must be control; since there must he someone who enjoys; and since there is activity for release. It had been pointed out that the release is obtained by the discriminative knowledge of the Manifest, the Unmanifest and the Knower. So, after (the knowledge of) the Manifest, the Unmanifest has been known (to exist) by five reasons (verse 15). Like the Unmanifest the Spirit also is subtle. Now, its existence is proved by inference. The Spirit exists. How? — Since composite objects are meant for another. It is inferred that the composition of Mahat and the rest is meant for the Spirit, because, it ( i.e., composition) is unconscious like a bed. For example. a bed-is composed of gātrotpalaka, a foot-stool, a covering cloth of cotton and a pillow; it serves another person’s purpose and not its own. The different parts, viz., gātrotpalaka, etc., of the bed cannot serve any mutual purpose. So, it is inferred that there is a man who sleeps on the bed,—for whom this bed is meant. So, this body, a composite of five gross elements, is meant for another. There exists the Spirit for whom this enjoyable body is born; the body which is a composite of Mahat and the rest. Hence also, the Spirit exists:—since it is the rerverse of that which has the three Attributes, viz., “possessed of the three Attributes, non-discriminated, objective, etc.,” mentioned in the previous verse,—the reverse of this. Because. it was said: “the Spirit is similar and dissimilar to that.” Since there must be control. As here, a chariot, united to horses capable of leaping, galloping and running, functions only when controlled by a charioteer, so does the body function on account of the control of the Spirit. As it is said in the Ṣaṣṭitantra—“The Nature functions when controlled by the Spirit.” Hence, the Spirit exists.—Since there must be someone who enjoys. For example, we infer that there must be an enjoyer of mixed food flavoured with the six flavours, viz., sweet, sour, salt, pungent, bitter and astringent; similarly, because the mergent Mahat and the rest are not enjoyers, (we infer) that the Spirit exists,—for whose enjoyment this body is. Hence, also (the Spirit exists), since there is activity for release. Kaivalya is the abstraction of kevala (alone); the activity for this purpose; from this activity for its own release, it is inferred that the Spirit exists. For, everybody, learned or otherwise, desires for the cessation of the cycle of his births and deaths. For these reasons there exists the Spirit apart from the body. And the mind exists-for-another, also because the it is variegated by innumerable residua, inasmuch as it acts by combination. This mind is variegated by innumerable residua. It must therefore exist for another, i.e. for achieving the enjoyment and emancipation of another, not for the achievement of its own object. Because it acts by combination. As a house which has assumed its shape as such, by various materials being brought together, cannot come into existence for itself, so also the mind which assumes a particular shape by more things than one coming together. The mental phenomenon of pleasure does not exist for its own sake; nor does knowledge exist for itself. On the contrary both these exist for the sake of another. That other is the Purusha who has objects to achieve in the shape of enjoyment and emancipation. It cannot be another of the same class. Whatever else the Vainashika speaks of beyond this as being of the same class, all that must be of the same, acting as that also would do by combination. The other however is peculiar to itself and differs from the others in not acting by combination. That is the Purusha. Nyaya: Here is what Gautama says in Adhyaya 1 Pada 1 Sutra 10 of the Nyaya Sutras. Desire, Aversion, Effort, Pleasure, Pain and Cognition are the indicative of the Soul. As a matter of fact, it is found that the Soul is not apprehended by Perception; the question then arises as to whether it is known only by means of "reliable assertion." The answer is that it is not so; as Soul is cognized by means of Inference also.... The Soul having experienced pleasure with a certain kind of things, whenever in the future, he happens to see a thing of that same kind, he wishes to acquire that thing; and this wish to acquire is possible only in one who, while remaining one and the same, perceives several things; as it arises from his remembrance of a previous perception; it is thus that Desire becomes and and indicative of the Soul.... When a certain kind of thing has been found to be the cause of pleasure, on subsequently seeing a thing of that kind, the man makes an attempt to attain that thing; and this Effort would not be possible if there were not one agent perceiving a number of thing and recollecting his past perceptions; specially no such Effort would be possible if there were only a series of distinct cognitions, each pertaining to its own distinct object; for the Effort of one cognition on the basis of the experience of another cognition would be as impossible as the Effort of one body on the basis of the experiences of another body.... When a man is desirous of knowing or understanding [something], at first he ponders over it in the form "What may this be? "; and pondering thus he comes to know it in the form "This is so and so". This Knowing of the thing is by the same agent as the previous desire to know and the consequent pondering; so that this Knowledge, Cognition, becomes an indicative of the presence of the common agent in the shape of the "Soul". Inasmuch as it is extremely subtle in its character, and as such imperceptible, its cognition is brought about by means of the organs of hearing etc., as inferred from perception of Sound etc. ; aided by the fact of such instruments as the axe and the like being always operated by a doer or agent. In the cognitions of sound etc. also we infer a "cognizer." This character cannot belong to the Body, or the Sense-Organs, or the Mind; because all these are unintelligent or unconscious. Consciousness cannot belong to the body; as it is a material product like the jar; and also as no consciousness is found in dead bodies. Nor can consciousness be found in the Sense-organs; because they are mere instruments; and also because we have remembrance of objects even after the sense-organ have been destroyed, and even when the object is not in contact with the organ. Nor can it belong to the Mind, because if the Mind be regarded as functioning independently of the other organs, then we would have perception and remembrance simulaneously presenting themselves; and also because the mind is a mere instrument. And thus the only thing to which consciousness could belong is the Self, which thus is cognized by this consciousness. As from the motion of a chariot we infer the existence of an intelligent guiding agent in the shape of the charioteer, so also we infer an intelligent guiding agent for the body, from the activity and cessation from activity appearing in the body, which have the capacity of acquiring the desirable and avoiding the undesirable object. The intelligent agent is also inferred from the actions of breathing etc. "How?" When we perceive a variegated function of the Air contained in the body, (we infer the existence of a guiding agent), who would act like the blower of the wind-pipe. From the regular action of winking up and down, we infer the existence of the agent, who would be like the puller of a pulley. From the fact of the wounds of the body being healed up, we infer an existence of an agent who would be like the master of a house repairing it.... Then again, from the qualities of Pleasure, Pain, Desire, Aversion, and Effort, we infer the existence of one to whom those qualities belong... The existence of the Self is also proved by the fact of its being spoken of by means of the word "I" which is distinct from the words "Earth", "Water" etc. The opponent asks: "What is this other entity? We do not know any other such entity (other than the body)." We infer the existence of such an entity from the acts of breathing and the like; so that [the soul] is one who carries on such activities in the body as breathing in, breathing down, winking, and so forth. "But it is the body itself which breathes in and breathes down." Not so; breathing and the rest cannot belong to the same category as the properties of the body, because they do not continue to exist as long as the body lasts; as a matter of fact we find that the properties of the body, color and the rest, continue to exist as long as the body is there; on the other hand, breathing and the rest cease to exist even while the body is there. Then again, Pleasure, Pain, and other such feelings are cognized only by the person himself, while color and other properties belonging to the body are perceived by other person as well. from this fact of there being certain properties which differ from the properties belonging to the body, the conclusion is that [the soul] is other than the body. The assertion that the Self is not separate from the body cannot be maintained. The Self rather must be something separate from the body, 'because the existence (of the Self) does not depend on the existence of that (i.e. the body).' For if from the circumstance that they are where the body is you conclude that the qualities of the Self are qualities of the body, you also must conclude from the fact that they are not where the body is that they are not qualities of the body, because thereby they show themselves to be different in character from the qualities of the body. Now the (real) qualities of the body, such as form and so on, may be viewed as existing as long as the body exists; life, movement, &c., on the other hand, do not exist even when the body exists, viz. in the state of death. The qualities of the body, again, such as form and so on, are perceived by others; not so the qualities of the Self, such as consciousness, remembrance, and so on. Moreover, we can indeed ascertain the presence of those latter qualities as long as the body exists in the state of life, but we cannot ascertain their non-existence when the body does not exist; for it is possible that even after this body has died the qualities of the Self should continue to exist by passing over into another body. The opposite opinion is thus precluded also for the reason of its being a mere hypothesis.--We further must question our opponent as to the nature of that consciousness which he assumes to spring from the elements; for the materialists do not admit the existence of anything but the four elements. 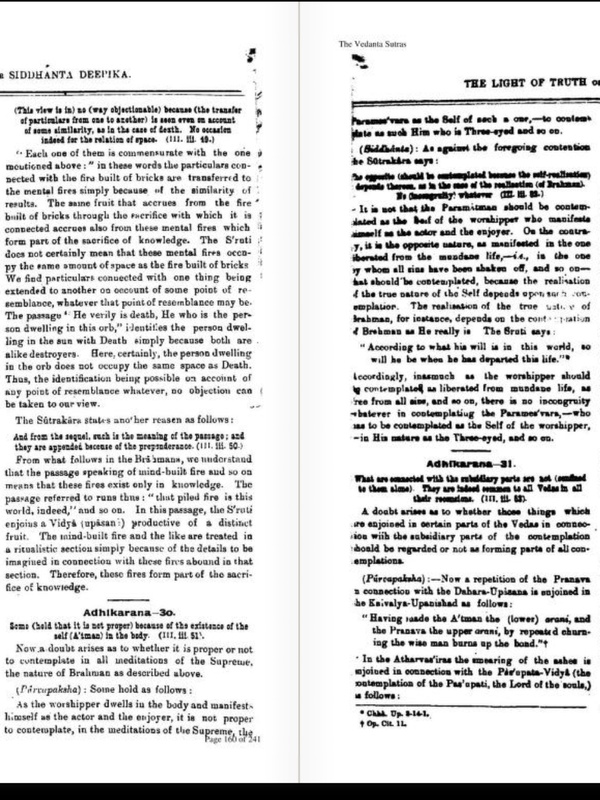 Should he say that consciousness is the perception of the elements and what springs from the elements, we remark that in that case the elements and their products are objects of consciousness and that hence the latter cannot be a quality of them, as it is contradictory that anything should act on itself. Fire is hot indeed but does not burn itself, and the acrobat, well-trained as he may be, cannot mount on his own shoulders. As little could consciousness, if it were a mere quality of the elements and their products, render them objects of itself. For form and other (undoubted) qualities do not make their own colour or the colour of something else their objects; the elements and their products, on the other hand, whether external or belonging to the Self (the organism) are rendered objects by consciousness. Hence in the same way as we admit the existence of that perceptive consciousness which has the material elements and their products for its objects, we also must admit the separateness of that consciousness from the elements. And as consciousness constitutes the character of our Self, the Self must be distinct from the body. That consciousness is permanent, follows from the uniformity of its character (and we therefore may conclude that the conscious Self is permanent also; as also follows) from the fact that the Self, although connected with a different state, recognises itself as the conscious agent--a recognition expressed in judgments such as 'I saw this,'--and from the fact of remembrance and so on being possible. But most commentators on the Brahma Sutras do not think that these Sutras have anything to do with the existence of the soul. For instance Ramanujacharya thinks that these Sutras are about the fact that during meditation, one must conceive of one's own soul in its released state, not its state while inhabiting a body; see this section of Ramanujacharya's Sri Bhashya. And Nimbarka and Srikantha Sivacharya agree with him, as you can see here and here. Because of this, I'm not sure what these commentators believe about how to prove the existence of the soul. It could be that all Vedantic philosophies agree with Adi Shankaracharya's logical argument, and they just make this argument elsewhere in their works. Or it could be that they disagree with Adi Shankaracharya and think that the existence of the soul requires scripture to establish. I've posted a question on this here, but I haven't received an answer yet, despite putting a bounty on it. On a side note, whatever disagreements Vedantic philosophers may have about how to prove the existence of the Jivatma, all members of the Vedanta school agree that the existence of Brahman requires scripture to establish; see my question and answer here. Not the answer you're looking for? Browse other questions tagged philosophy vedanta atma jiva shad-darshana .